Store closing news has and will continue to focus mainly on the status of the largest U.S. retail chains that are closing the largest number of retail brick-and-mortar stores in 2016. Inferences will be made about the health of the store-closing retail companies specifically, as well as the U.S. retail industry in general. But one aspect of retail store closings in 2016 (and every year) that gets overlooked is the impact that store closings have on the retail economies of the states where the store closings are happening. Looking at the 2015 State-by-State Store Closings Roundup, it's easy to see that the states of Arizona, California, Florida, Pennsylvania, and Ohio were among those hardest hit by a sizable number of U.S. retail chains closing a sizable number of brick-and-mortar retail locations. 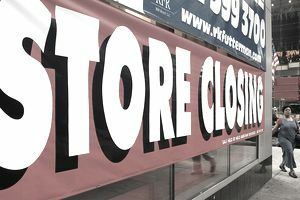 Trying to analyze the significance of store closings in a particular state is a tricky chicken-and-egg exercise. Is it that the consumers and the economies in certain states aren't active and robust enough to support a healthy retail industry? Or is it more a matter of a retail chain losing its retail relevance, forcing a massive downsizing (or bankruptcy) that just happens to be concentrated in a particular geographic area? Looking at the state-by-state list of store closing locations makes it a little easier to determine which is the cause and which is the effect between the retailer and the state. The closings from easily identified "troubled" retail chains are most likely wreaking havoc for the state's retail economy. The states with a large number of store closings from a wide variety of retailers are likely the cause of the closings, rather than the victims of them. This State-by-State Store Closings list will be constantly updated throughout 2016, and as the year goes by clear patterns will emerge. So, BOOKMARK THIS PAGE to return for updates as they happen all throughout the 2016 calendar year. What follows is the list of going out of business sales that are currently underway, stores that will be closed in the 2016 calendar year, and store closings that have already happened this year in the states of Alabama, Arizona, Arkansas, and California. This store closing, and going out of business sale list was last updated on May 17, 2016. Walmart, Macy's, Sears, Kmart, jcpenney, The Gap and more large retail chains are closing stores in the state of California in 2016. 1300 W. International Speedway Blvd. Unit #295 Mall Road St.
Hill Ave. & Park Rd. 104 Interstate 35 Frontage Rd. 8501 W. Brown Deer Rd.